Louison Bobet, won the 1953 Tour de France by over 14 minutes but it was not just the time .. it was also the style. At the start if Stage 18 Bobet was lying 3rd on GC some 3m13s behind Mallejac of the French regional team - Ouest. But Stage 18 was a 165km route from Gap to Briancon via the Cols of Vars (2,111m) and the Izoard (2,360). At the summit of the Col du Var, after 91km, two riders were in the lead - Deledda and Dacquay with Quennehen just 15sec behind and Lorono / Bobet at 1m45s. But by the summit of the Izoard, 141km, Bobet was alone in the lead by 2m3s from Nolten with Lorono 3rd at 4m15s, Serra 4th at 7m20s, Geminiani 5th at 7m35s and Bartali 6th at 8m22. As you can see from the photo (below) it really was a solo break on the Alpine climb. Even Fausto Coppi, a spectator rather than a competitor this time, was impressed - exclaiming “Il est beau!” at the sight. Bobet punctured on the descent - but had a rapid rear wheel change that only slightly slowed his progress. He arrived in Briancon alone to take the stage by over 5mins and the Yellow Jersey by over 8 mins. The next day in the mountains made little change to the overall position but the final time trial gave Bobet the chance to show how good he was - winning the stage and putting another 6mins onto his lead over Mallejac. It was all over bar the triumphal entry into Paris - and setting a new record average speed for the Tour. THREE days before the Tour de France started Louison Bobet was still a doubtful starter, having hardly recovered from the effects of his disappointing Tour of Italy, which put French cycling very much down in the dumps. And now, three days after the finish of the Tour, the sport is way up in the heights again, thanks to Bobet's opportunist victory. It was an opportunist victory because, with Coppi and Kubler non-starters, Koblet and Robic eliminated by crashes, he was at last freed of the factors that invariably give him a beaten complex in stage races. Bobet, therefore, attacked fearlessly and successfully on the crucial stage of the race - the second day in the Alps - and took over the “maillot jaune" never to lose it. Thus the (supposed) underlying motive for making the Tour easier and shorter has been realised in finding a French winner, and a French runner-up - Six Provinces rider Malleiac held on to that "second" till the end. The shortened formula made for faster racing, and Bobet's average 21.3 m.p.h. and that of the last man (21 m.p.h.) are faster than Bartali's record 20.9 average in 1948. MUSCLES may have been relaxed during Monday's rest day at Monaco, but very few minds were idle. Riders were wondering what the Alps had in store for them in the next few days, and the directeurs techniques were busy plotting out elaborate strategies on their behalf. Journalists tried to pick these scheming brains and phoned big stories through to the papers on how they thought the final stages of the Tour would turn out. Most predictions were that the Italians would launch an offensive on the second stage after the rest day, on the 102 miles stretch between Gap and Briancon, which contained both the Col de Vars and the Col d'lzoard. 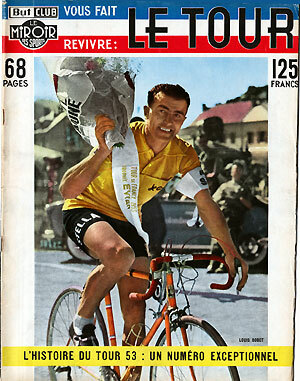 Their best man, Astrua, was only lying 1m 13s behind maillot jaune Mallejac, and two minutes ahead of Bobet. IT was little Mirando (Ian Steel's great rival in the "Six Provinces") who was earliest in evidence. Out for points in the Best Climber's prize, he was first to the top of both the Col du Pilon and Col des Leques, but it was the Spaniard Serra who took over the leadership on the Labouret climb at the 200 kms. It was on this mountain that Fausto Coppi appeared with a group of his Bianchi team-mates to cheer on the Italians. The sight of his arch-rival gave new life to old Gino Bartali, who tore away from the peloton on the descent, and looked as if he might pull off an individual victory to celebrate his thirty-ninth birthday. But on the final climb to the top of the 3,100 ft. Sentinelle, Wagtmans, of Holland, who had been one of the party of six who had joined Bartali in a general regroupment, got away and beat him into the finish by 44 seconds. Bartali jumped up four places and got within 16m. 46s. of the maillot jaune Mallejac. But he was still only 14th on general classification - the first 10 men were covered by less than 10 minutes! THE great day of the showdown arrived, with a scorching sun beating down from a cloudless sky when the field of 82 set out from Gap. Tension was high, for it was obvious that Vats and Izoard would wreck that 10-minute-for-10 places situation. Although the big climb of Vars did not start until the eightieth, kilometre, the approaches to it were, themselves over gradually rising roads. ; From the starter's gun three men were away, regional riders Quenehen and Dacquay, with French national rider Deledda. The three kept away, were first to the top of Vars, with Bobet - already 2m. 55s. ahead of the maillot jaune - only a minute or so behind. On the descent of Vars the strategy of the French national team became clear: Deledda allowing himself to be dropped by his companions, waited for Bobet, and took his captain on his wheel for the opening phase of the Izoard battlefield which began immediately the Vars drop had finished. Then on the torturous heights which rise 2,600 ft. in five miles, and with his work done, Deledda was dropped by the astonishing Bobet, who tore into the fray and reached the top 3m. 40s. ahead of the next man, Nelten. Fausto Coppi saw Bobet pass on his triumphant way. On the descent Bobet punctured, lost nearly a minute, but was still 5m. 23s. ahead of Nolten. He had won the stage, taken over the maillot jaune, for although Mallejac put up a magnificent defence, he finished 11 minutes behind. Bartali was 10 minutes back (after a puncture), was 11th on general, 24 minutes behind Bobet, and now without a chance of winning his third "Tour" Mallejac was still second, Sm. 35s. in arrears, and Astrua (at 9m. 48s.) third. ONCE again a finishing list had that "early stage" look, with a big bunch of 60 finishing together, preceded by a few impetuous souls. But this time that peloton contained not half a dozen possibles watching each other, but one almost certain winner. Bobet was sitting pretty, and Meunier, Forrestier, Lorono, Couvreur and Langarcia's break did not worry the maillot jaune, but he personally "controlled" any attempt by highly placed men to get away. Even so, that small break helped the N.E. Central France up in the team race, for Meunier (who won the stage) and Forrestier (second) were both under their colours. The team situation was therefore most interesting : Holland leading; with French Nationals eight minutes behind, and the N.E. Centre trio another nine minutes slower than the French. A comparatively quiet day, which was only to Lie expected, sandwiched as it was between the decisive Alpine stage and the time trial. “THE Truth Race" is what the French call a time trial - and no lies were told on Friday about this Jubilee Tour de France. The truth was told that Louison Bobet was by far the best of the 76 survivors and that he was perfectly entitled to be wearing the Maillot jaune. Despite a puncture near the end, he beat Van Est into second place by 11 minutes. But "truth often hurts!" There was a painful up-and-down stretch for the first 30 km. then, on a badly surfaced road which climbed 1,800 ft. in 20 kms., the real agony came before the corkscrew descent into the city of cycles. 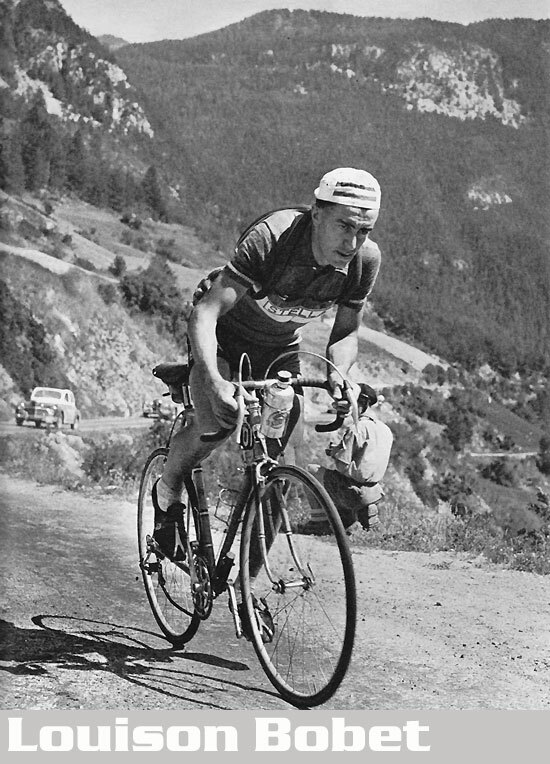 The advantage was therefore with the climbers, as Lorono showed by his unexpected fifth place four minutes behind Bobet. Magri (thirty-fourth) and Geminiani (fifty-fourth) were the biggest failures of the day. First man was off at 10 a.m., the last, Bobet, at four minutes to three! (Four-minute intervals between riders.) Early starter Remy put in novel "domestic" work by telephone from the finish to captain Bobet, advising him of the state of the course. 1, Bobet, 1hr. 49m. ; 2, Van Est, 1-50-45; 3, Schaer, 1-51-47; 4, Wagtmans, 1-52-25;:5, Lorono, 1-52-56; 6, Bauvin, 1-52-57; 7, Astrua, 1-53-13; 8, Morvan, 1-53-39: 9, Close, 1-53-40: 10, Mallejac, 1-53-43; 19, Bartali, 1-55-1. LOUISON BOBET had virtually won the Tour de France, but his team- mates now had the double job of looking after him and trying to wrest the team honours from Holland. But the Dutch were not just content to defend their place, they attacked and increased their lead. Instrumental in this success were Wagtmans, who gave Holland her fifth stage win of the Tour, and Nolten, third. Wagtmans's win also put him above Schaer to fifth place on general. THE great day at last with thousands to see them off at 7 a.m., millions along the route and 35,000 at the Pare des Princes. For 200 kms it is the traditional "promenade" punctuated by many primes; one of them, for 100,000 francs is won by Darrigade. Then Bobet tries once, twice, three times to get away, but enemy forces have their eye on the grand finale sprint as well, and bring him back. Finally nine riders succeeded and entered the Parc des Princes stadium together; three of them were Italians, and almost inevitably they manoeuvred themselves for Magni to win the sprint.